The Pepi Gabl is a great hit with families wishing to enjoy all that St Anton has to offer. The chalet's location is unrivalled, being right next to the Nasserein gondola for quick access to the slopes each morning and with St Anton’s charming centre only a short walk away. The owner has improved the chalet hugely by adding a wonderful family-friendly extension of the communal areas on the ground floor, to provide an impressive lounge and bar area. Dedicated bar staff are on hand to offer a full bar service as part of the chalet’s additional features as an ”Xtra” chalet. A second phase of refurbishment also resulted in the addition of several new rooms and suites, as well as the extension of some bedrooms on the lower floors. Classic Austrian wooden furnishings feature throughout the building whilst the generous modern lounge provides an ideal area to mingle before or after dinner. The dining area consists of a series of tables with upholstered bench seating in the traditional Austrian “stube” style, and features pine-clad walls and decorative ceiling panels. There is also a separate adjoining breakfast room to make the start of each day run more smoothly for all guests. To complete the attraction of the Pepi Gabl, a spacious Wellness area is on the lower ground floor, with a sauna and spa bath where parents and children over 13 may relax at the end of the skiing day. Our Nursery in St Anton is located within the chalet and has been completely fitted out to our requirements to provide a bright cheerful play space for our youngest guests. This is where we also operate our evening Mini Cocoa Club from 7.30-9.30pm for 3-5 year olds who may not yet be in bed whilst their parents are enjoying dinner. Supervised lunches will be held in the Pepi Gabl for all children in Childcare as well as their accompanying staff. Furthermore we have arranged ski hire for all families booking their ski equipment with us in our partner ski hire shop just next door so hitting the slopes first thing on Mondays is a breeze. Suite 301, Sleeps 4-5, Twin room with balcony, small twin room and walk-through room with child single sofa-bed with bath/wc. This suite is recommended for a maximum of 2 adults and 3 children. Cots will fit in all rooms/suites except suite 301. Please note that space may be limited if suites on the 3rd floor are booked with full occupancy. On the one staff night off per week, a breakfast is served as a buffet in our Xtra Chalets. In all our Xtra Chalets, we also prepare a homemade soup and a savoury treat to accompany the sweet ones. Our ‘Xtra’ chalets are enhanced by the option between a cheeseboard and dessert, and a rosé wine is added to our usual choice of reds and whites. On the two staff nights off per week, a continental style breakfast is laid out for you to help yourselves in all chalets whilst it is served as a buffet in our Xtra Chalets. We update Chalet Pepi Gabl's details often, but facilities do change. e.g. some extras listed by the supplier as "free" or included might only be for the first time you use them, or for one time per party, then charged for further use. If any specific feature is essential to your holiday, make sure you ask us to confirm the details of it before you book your holiday. This package holiday to Chalet Pepi Gabl in St Anton, Austria departs Saturday 14th December 2019, for a 7 night stay on a "catered chalet" board basis. A local tourist tax (Taxe de Sejour or Kurtaxe) is levied by many councils in European ski resorts. It varies by standard and type of accommodation and is age dependent, so not everyone is charged. It's not included in the basic price of your holiday and is usually paid locally. For reference, the average charged in winter 15/16 was between 50p and £2 per person, per night. St Anton lift pass price last reported as €228 (adult 6 day). Ask for a quote when booking Chalet Pepi Gabl. 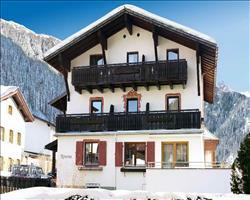 Chalet Alpenheim St Anton Austria, Dover Ferry 14th December. Very good, not luxurious but clean and tidy. The lounge was very nice for socialising and felt safe for the children to play in. The staff were great, and they provided childcare when we wanted to go out. It was incredibly child-friendly. Perhaps not the best place for very young children as there are quite a few steps inside the chalet to get to the rooms, etc. Our children were 5 and 6 and it was great for them. The location is absolutely fabulous. Even in late spring, you could ski almost all the way back to the chalet. In the middle of winter it must be basically ski in / ski out. They managed to keep the run back down to town open even though there wasn’t so much snow left. The main gondola and the equipment hire shop are right next door to the chalet. They were still upgrading the rooms while we were there, but I think by next season they will be finished upgrading all of them. 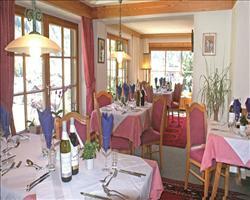 "Food and staff great but chalet needed some maintenance work"
The chalet was good but there was some maintenance which needed addressing. The toilets downstairs needed cleaning, our room needed smartening up and the child’s bed in our room was broken for the entire duration of our stay. I’m not sure if this was related to it being the end of the season. Otherwise the service was very good. The food was also very good, although they were also running out of things on the catering side because it was the last week. For example there wasn’t enough jam at breakfast, etc. They did a standard continental breakfast with some hot options and then an excellent 3 course dinner. We had a quad room with 4 beds, it was a bit of a squeeze but it was alright. We had a little fridge and a bit of a kitchenette which meant that we could come back to the chalet for lunch – that saved an absolute fortune, it can get very expensive eating out with four of us. Not all the rooms have this, only the larger ones. All the staff have been excellent during our stay. However particular mention to the positive impact that the staff have had on both our boys. They have been excellent role models and really brought their confidence and personalities out. Facilities and location were superb. The staff were all very enthusiastic and were brilliant with the kids. Great childcare, felt very comfortable leaving my young children in their care. Lovely relaxing holiday for us with the opportunity to do as much skiing as we wanted and we even managed some apres ski which we have never managed on a family ski holiday before. All the members of staff were very friendly, especially with the kids. They are always kind with a lovely attitude, nothing seems to be a problem to them. Well done to all of them, made our holiday a memorable one. Great holiday... chalet staff, childcare and skiing all beat expectations. We'd never done this before and with 4 children we were nervous but we've had the best time ever.